Jesus Christ Superstar starts touring Australian arenas this week! The Jesus Christ Superstar Australian Arena Tour kicks off this Friday, in Perth! Tim and the rest of the cast, musicians and crew were reunited and started rehearsals yesterday. A great many of the shows are now sold out but you can still pick up tickets for: the Perth matinee on the 2nd June; both the matinee and evening shows in Sydney on the 9th June; Melbourne matinee and evening shows 14th-16th June and for the final show of the tour Brisbane on the evening of the 18th June. Tickets and the full list of dates can be found at jesuschristsuperstar.com. Just in case you’ve missed the earlier announcements: Tim’s reprising his award-winning performance as Judas Iscariot for the Australian arena tour of Jesus Christ Superstar, while Melanie C and Ben Forster will also be returning in their roles from the UK production as Mary Magdalene and Jesus. Deal or No Deal host Andrew O’Keefe will play King Herod and Jon Stevens, who appeared as Judas Iscariot in the 1992 Australian arena tour of the show is taking on the role of Pontius Pilate. Tim Talks Matilda with Charlie Rose Tonight! Tim will be joining his partners in crime – writer Dennis Kelly, director Matthew Warchus and actor Bertie Carvel – to talk to Charlie Rose about the runaway success of Broadway’s hottest new show (not that we’re biased or anything), Matilda the Musical. The show will air tonight, 15th May 2013, in America on PBS. The time that the show airs depends on which your region you’re in, so to find out when you’ll be able to see it, please visit the PBS website. As a rough guide though, it’ll be somewhere between 10pm and 11pm. The show will be repeated tomorrow lunchtime and the interview will be available on the Charlie Rose website shortly afterwards. Charlie Rose also airs internationally on Bloomberg Television the next day, so those in the UK will be able to catch it tomorrow night, 16th May 2013 at 10pm. Bloomberg Television is also available on Foxtel in Australia, where it should air at 1am on the 17th May 2013, but please check your local listings. Theater Talk is co-hosted by Michael Riedel (Broadway columnist for the New York Post) and series producer Susan Haskins. In April they recorded an episode devoted to Matilda The Musical, on Broadway, talking to Tim, Dennis Kelly and Bertie Carvel. Last night, the 2013 Broadway.com Audience Choice Awards ceremony was held at the Time Warner Center. Tim collected the award for Favorite New Song for ‘When I Grow Up’ and Bertie Carvel won Favorite Breakthrough Performance. Three of Tim’s songs had been nominated as we blogged here. Thank you to all those who cast their votes for Matilda. UPDATE: There’s now a little interview and a pic of Tim with the award on the Broadway.com website. 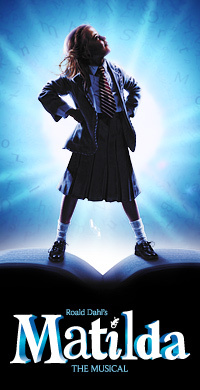 There’s more: On Friday Matilda the Musical won Best Musical at the 78th annual New York Drama Critics’ Circle Awards! The Circle comprises twenty six drama critics from the daily newspapers, magazines and wire services, based in the New York City area. They meet twice a year, at the end of each theatre season, to vote on the awards. So if you’ve got more voting juice left in your typing fingers, then please click here to vote. You can read more about the show’s story and see photos, videos and reviews on the Matilda Page. Or check out the HUGE list of further awards the show is nominated for this year, including twelve Tonys.